Image and Picture Viewer. Quick Launch Menu. Context Menu Extension. ClickYes Pro 2010 is a tuning tool for Microsoft Outlook security settings. It allows to configure which applications can automatically send emails using Outlook and access email addresses stored in Outlook address book. ClickYes Pro 2010 runs as a background task providing a convenient icon in the taskbar notification area to manage allowed applications. It uses the encrypted storage and is highly secure and safe. If you use an application that triggers the Outlook security warnings, you will find this software very handy. Note. This software works under Microsoft Windows desktop operating systems (64-bit and 32-bit), Microsoft Windows Server operating systems (64-bit and 32-bit), and supports all 32-bit Microsoft Outlook versions (including Outlook 365, Outlook 2016 and Outlook 2019). Context ThumbView is a small picture viewer that provides image files preview directly in the right-click menu. It supports most of popular image file formats, including BMP, GIF, JPEG, PNG, TIFF, PCX, WMF, EMF and is very handy for quick image viewing. To launch Context ThumbView, just right-click on an image file in Windows Explorer. 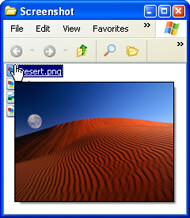 It allows to save thumbnails, send them by email or copy to the Windows Clipboard. As a shell context menu extension it is available in any Explorer window, including Search Results, Open and Save As dialog boxes. Thumbnail dimensions and additional displaying options can be changed using Configuration Manager. Note. This software requires Windows XP/2003 or Windows 95/NT with Internet Explorer 4.0 (or later) and Windows Desktop Update installed. Instant ThumbView is a tiny image viewer that displays image thumbnails in a tooltip window, when mouse pointer is hovered over an image file in Windows Explorer. It supports a lot of popular image file formats, including BMP, GIF, JPEG, PNG, WMF, EMF, TIFF and is very handy for quick image viewing. To bring it up open any folder with image files in Windows Explorer, and place your mouse pointer over an image file name. You will see the thumbnail of selected image file in a small popup window just next to the mouse pointer. Thumbnail dimensions, additional displaying options and a list of image file formats can be changed using Configuration Manager. Favorite Shortcuts is a very easy-to-use desktop quick launch menu that provides fast one-click access to the hierarchical list of favorite programs, documents and folders, Windows quick launch items as well as lists of most recently used documents and folders. It is available as a hotkey-called popup menu, as an additional submenu in the Desktop context menu, in a folder background shortcut menu, in the Windows Explorer File menu, in the Internet Explorer Favorites menu and as an optional icon in the taskbar (system tray). To bring it up, right-click on the Desktop (or any other folder empty spot), point to Favorite Shortcuts, and then click an item in the popup menu. Also this quick launch menu available on right-clicking or left-clicking the Favorite Shortcuts system tray icon or pressing the correspondent keyboard buttons (hotkeys). Setup procedure creates preconfigured sets of shortcuts to essential Windows locations like My Documents, My Pictures, My Music, Control Panel, Administrative Tools, Quick Launch and so on. With Favorite Shortcuts, anyone regardless of the skill level can organize Quick Launch and clear unnecessary icons from the Desktop. You can easily copy or move files to your favorite folders, open them with your favorite programs, send by email and lot more. To bring it up, just right-click a file or folder in the Windows Explorer, and point to Context Magic in the pop-up menu. ClickYes Pro 2010 v3.5.9 released. ClickYes Pro 2010 v3.5.8 released. Have you ever looked for a picture viewer providing image files preview directly in Windows Explorer right-click context menu? Find out more about Right-click Thumbnail Viewer. Wondered if it's possible to open the Quick Launch folder in Windows Explorer? Learn how to do this using Favorite Shortcuts.